Water Quality: Norwegian Creek was assessed during the 2015 303(d) impaired waters listing cycle; total phosphorus and biological sample data clearly met 2015 WisCALM listing thresholds for the Fish and Aquatic Life use. This subwatershed is split approximately equally between Green and Rock counties. There are no State Natural Areas, County Parks, Rustic Roads, State Wildlife Areas nor municipalities within its borders. The headwaters of Norwegian Creek which arise in western Rock county flow southwesterly into Green County and enter the Mill Race at the south end of Decatur Lake. 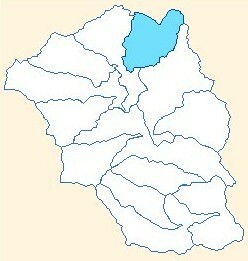 The stream has been straightened in many sections as it passes through largely agriculture lands. For a recent in-depth water quality study of The Lower Middle and Lower Sugar River Watershed which includes the Norwegian Creek Subwatershed click here. Head Gates Park is the only public access to Decatur Lake and the north end of the Mill Race. From here one can paddle north on the race to the portage around the dam on the west bank of the dike to access the main channel of the Sugar River. Or one can paddle south through the gates into the Mill Race and continue on to the spillway in Brodhead where a portage is necessary to access the Tail Race which leads to the river right above Crazy Horse Campground. 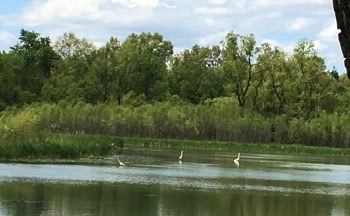 For birders, walkers and bikers, a portion of the Sugar River State Trail runs through this subwatershed, as well as through Taylor Creek and Decatur Lake - Sugar Creek Subwatersheds. A special feature on the trail is the replica of Clarence Covered Bridge, built in 1984, which transverses Norwegian Creek one-fourth mile north of Golf Course Road. The original bridge spanned the Sugar River at what is now Hwy 11 south of Brodhead. Looking for a fun, family-friendly 5K run? Each year on the second weekend of August Brodhead holds their Covered Bridge Days. The Saturday morning kick-off event is a 5K (3 mile) Fun Run/Walk starting on the Sugar River State Trail at Decatur Rd. 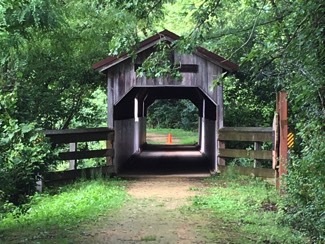 Participants run/walk to the covered bridge and then return to the starting point. If you want a t-shirt ($10) sign-up in advance at the Brodhead Fitness Center or on the day of the event. If not, just show-up and participate. It’s all about getting out and enjoying the outdoors while getting some exercise. If you are looking for an easy five mile loop to bike, one can start at several locations on the loop; however, this particular description starts at Head Gates Park where parking and bathroom facilities are located. Cross over the Head Gates and bike south on the trail paralleling the race to the spillway in Brodhead. Cross over the spillway, turn left onto 11th Ave and left again onto W. 3rd St which also becomes the State Recreational Trail as you pass its southern trailhead terminus where parking and bathroom facilities are also available. Stay on the trail and exit at Golf Club Rd by turning left. Continue on to Head Gates Park. 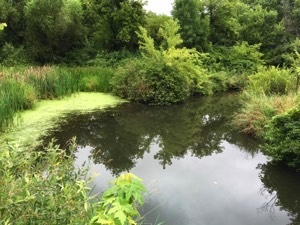 The section of Norwegian Creek in Green County (2.9 miles) is considered an Exceptional Resource Water (ERW) by the Wisconsin Department of Natural Resources (WDNR). The upper reaches of this segment support the Least Darter, a species of special concern in Wisconsin. Just outside the subwatershed’s northern boundary and south of Hwy 59 in Rock County lies 120 acre Magnolia Bluff County Park, a portion of which is designate a State Natural Area. The park entrance is on N Croak Rd. This park features outstanding rock outcroppings and vistas of the Sugar River Valley. Hiking and horseback riding are available on one trail and the other is reserved for hiking and cross-country skiing. For a printable PDF map of Norwegian Creek Subwatershed click here.